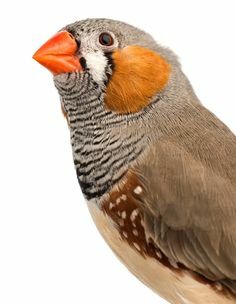 The redder the beak of a zebra finch the healthier it is, so the female bird thinks when she is selecting a mate, says an international team of scientists, who added that a bird with a strong colour – especially red – is generally good at cleansing harmful substances from its body. The intense red colour signals strong genes. An animal that can get rid of toxins – dexocify – is generally healthier than one that can’t. Across the whole animal kingdom, especially birds, the colour red is commonly displayed either in the feathers or beak of the male to attract a mate. An example of a very red beak seen as a sign of good health by the female can be observed in zebra finches (Taeniopygia guttata – formerly Poephila guttata). The males have a distinctive red beak, which is a sexually-selected characteristic. The redder the male’s beak, the more successful he is in getting a mate. A team of researchers from the University of Gothenburg in Sweden, the University of Cambridge, and Sheffield University, both in the United Kingdom, wrote about their latest study and findings in the academic journal Current Biology (citation below). Nick Mundy, who works at Cambridge’s Department of Zoology, and colleagues explained that for the first time they have identified the genes that allow most bird species to produce the red pigment that plays a major role in sexual selection (attracting a mate). These genes belong to a wider family of genes that also drive detoxification. Therefore, if a male has a strong red colour on its beak or other part of the body it may be a sign of good health – it suggests that the animal can cleanse toxins from its body. The authors say that this could explain what they call ‘honest signalling’ – a kind of ‘what you see is what you get’ – where a feature in an animal has evolved which is a genuine sign of fitter and better genes. In this case it is the male finch’s ability to expel toxins. Zebra finches, as well as many other bird species, get their bright-yellow pigments – carotenoids – from their diet of seeds. Some bird species may get theirs from other food sources, such as insects. Scientists knew that birds had to have a way of converting these yellow dietary pigments into red ones – ketocarotenoids – however, they did not know how this occurred, that is, until now. Ketocarotenoids give birds’ beaks, feathers or even bare skin their red colour. Jessica Stapley from the University of Sheffield, Staffan Andersson from the University of Gothenburg, and Dr Mundy, University Reader in Evolutionary Genetics at Cambridge, compared the gene sequences of wild, red-beaked zebra finches to caged finches that had a mutant recessive gene – this gene made their beaks yellow. They identified a cluster of three genes among the wild finches, which were either completely missing or mutated in this genetic region in the ‘yellowbeak’ (caged) birds. These genes encode enzymes – cytochrome P450s – which play a key role in breaking down metabolizing toxic compounds, mainly in vertebrates’ livers. These enzymes are well-researched in humans because they are closely associated with drug metabolism. In the world of birds, the colour red is believed to convey individual genetic quality. The researchers believe that one way the signal for good genes can be done is if the amount or intensity of red relates to other beneficial physiological processes, such as detoxification. Prof. Andersson and colleagues found the specific gene expression for one or more of the identified ‘red’ gene clusters in the birds’ retina, beak and feet – tissues that contained red pigments. The retina has cone-shaped photoreceptor cells. These retinal cones, found in birds – but not mammals – contain a range of brightly-coloured oil droplets, including green, red and yellow. It is thanks to these droplets that birds are able to see more colours than mammals, including humans. The authors say that the recently-discovered genetic links between red body parts – beaks, feathers and internal retina droplets – suggest that producing the red pigment evolved for seeing colours before the function for courting displays was developed, because all bird species have red eye droplets, but only some of them have external red colours. The scientists say that at the moment they are working on the genes involved in the red colouration of African widowbirds and bishops. In a separate study, carried out by scientists from the University of Oporto in Portugal, Auburn University in Alabama, USA, Washington University School of Medicine in St. Louis, USA, and Uppsala University in Sweden, they also identified an enzyme-encoding gene that allows some birds species to convert yellow pigments from the food they eat into red pigments. Details and finding of this separate study were also published in Current Biology (citation below). To make the discovery, the scientists focused on a special breed of canary-red factor canaries. These birds were developed in Germany before The Second World War. Yellow canaries were crossed with a finch from South American known as a red siskin, and then backcrossed with a canary. Citation 1: “Red Carotenoid Coloration in the Zebra Finch Is Controlled by a Cytochrome P450 Gene Cluster,” Jessica Stapley, Nicholas I. Mundy, Clair Bennison, Hanlu Twyman, Rachel Tucker, Kang-Wook Kim, Terry Burke, Tim R. Birkhead, Staffan Andersson and Jon Slate. Current Biology. 19th May 2016. DOI: 10.1016/j.cub.2016.04.047. Citation 2: “Genetic Basis for Red Coloration in Birds,” Leif Andersson, Miguel Carneiro, Geoffrey E. Hillcorrespondenceemail, Joseph C. Corbo, Pedro M. Araujo, James D. Johnson, Matthew B. Toomey, Ricardo J. Lopes, Mafalda S. Ferreira and José Melo-Ferreira. Current Biology. 19 May 2016. DOI: 10.1016/j.cub.2016.03.076.